It was a really fun week to watch our little baby cucumber turn into a big one. 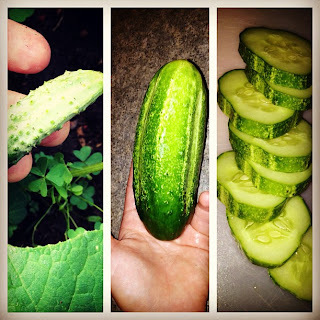 There are a couple more baby cucumbers on the vine and I hope more will come! I picked this one yesterday and between my hubby, daughter, and I it was gone in a few minutes. It was yummy and juicy! I absolutely enjoy having my little garden and am making bigger plans for next years garden. :) My daughter is having fun helping water the garden and she loves peeking at the growth each day.